While I’m not a huge Ferrari guy on principle, even I refuse to apologize for how much I liked the 458 Italia and now its turbocharged successor, the 488. And the new 488 Pista is the one you want because it boasts Ferrari’s most powerful V8 engine ever, rated at 711 horsepower. Now this weekend at Pebble Beach, we got treated to the 488 Pista’s convertible Spider variant. I can think of worse ways to work on your tan. 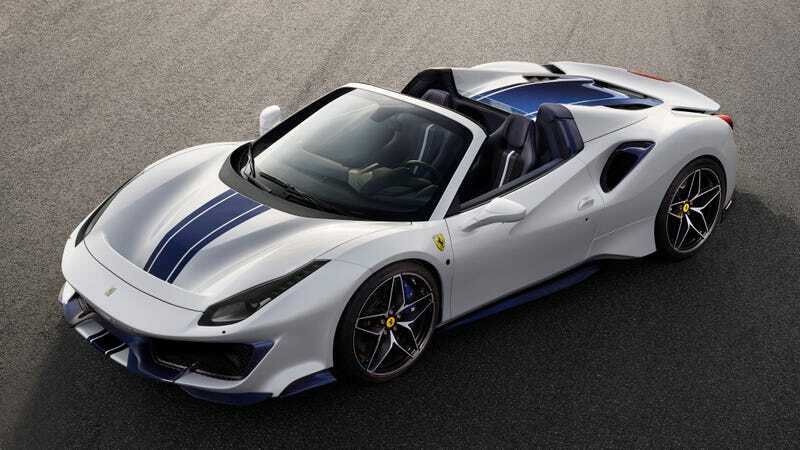 According to a news release, Ferrari said premiering the 488 Pista Spider in the U.S.—including with a very America-appropriate white-and-blue color scheme—“was a natural choice given that, ever since the 1950s, North American clients have always been keen connoisseurs of high-performance convertibles.” Lord knows I am! To make it feel like even more of a race car, Ferrari has draped the interior with Alcantara and carbon fiber, switched the floor mats out with aluminum plates and replaced the door handles with simple leather straps. Haven’t you always believed door handles were unnecessary? It’s great to see someone agrees here. Anyway, I dig the Pista. You should buy three of them.